The perfect effortless look to kick off the week, isn't it? Mi piace da matti il cappotto sai? E chi l'avrebbe mai detto che l'animalier cominciasse a convincermi. Beh, se abbinato così bene c'è poco da fare no? Super trendy e chic! Che bella proposta e favoloso il coat! Un bacio. Beautiful! I just ordered my animal print coat and can't wait to hold and wear it! Al solito Lilly hai ricreato perfettamente il look. A me piacciono molto i jeans di Mango andro a vedere se li trovo. Visto che nel mio armadio hopraticamente tutti i pezzi che haiselezionato,mi ha suggerito un look tutto da copiare. Grazie Lilli. 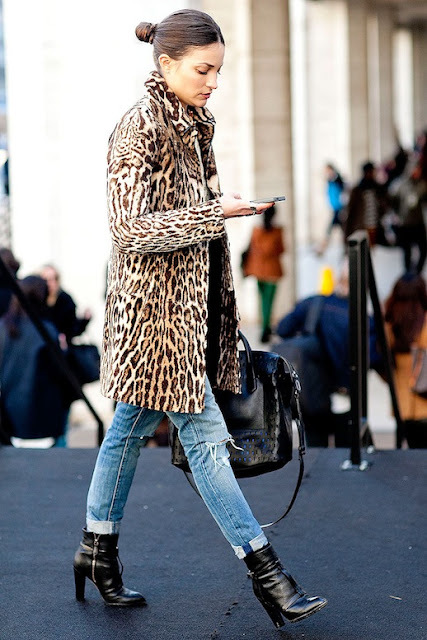 Leopard coat with denim and black boots and bag is so Saint Laurent style. So chic. The bag and boots are so stylish. Lilli, you have to know that this is one of my favorite features that you dod cause I'm always telling you but I think this may be my favorite outfit too. The whole look is just so effortlessly chic and sophisticated and you nailed it from head to toe. I wish I could be wearing this right now :) Have a lovely week dear. Wow, this is my outfit dear Lilli. Casual with one special pieces. Leo print is my new passion. Few years ago I would never wear animal print. But last week I bought a skirt with this pattern. This faux fur coat is to die for. Great job, dear Lilli. I like the rubric copie for less. Il cappottino animalier è fantastico! Davvero costa così poco quel cappottino? Lo voglio!!!!! I have wanted a leopard coat for ever! This one looks great and is super affordable as well! That look would definitely make me look more polished than what I'd feel at the start of the week hehehe. Loving the coat find. So stunning! Hi Lilli! I not dare still with a maxi coat of leo print, but I like to see in other girls! Btw I like this ripped pants are so cool! Happy monday! You nailed it again, Lilli! I love the boots. La pelliccetta è stupenda .